Cables are not hard, but they do take a tiny bit of finesse. And nerve. Yeah, nerve if you’re moving stitches in front of and behind the working row without losing them. There are cable needles to help you do this, probably 10 or so different kinds, but I just use a dpn. There is also a method where you just slip the stitches off the needles in blind faith, hold on to them and then knit them in turn. I’ve tried it and although it works, for me, it’s just as easy, and actually quicker to just wield the mighty DPN. So, all that being said, if you’ve never tried cabling, really it’s easy. And HERE is a tutorial to help you along. 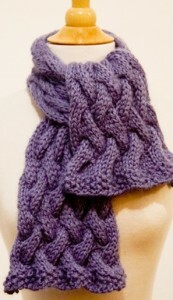 And, then HERE is the free pattern for this scarf. Thought I didn’t know how to blog?? Ha! Ha ha, who did it for you?